Spring Showers is a short collection of poems on inner illumination and higher love written by Hari Prasad Shastri. It was first published while he was in China, 1918-28.
Who can fathom the depth of the ocean of fate? And who can untie the knot of the future? What is good and what is evil even Bhishma could not decide. Or to be a mighty ruler like Nero? Or to frequent the society of the agnostic who doubts his very existence? And that my heart bubbles over with love. Let it be my supreme bliss to pour out the stream of my love at the feet of beauty absolute. And to sing to my love who is Beauty Incarnate. 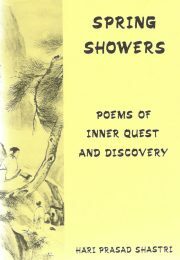 Seekers of higher knowledge may find insights in the poems of Spring Showers, as well as legitimate recreation.